Nestled on the Georgia coast, midway between Savannah, GA, and Jacksonville, FL, St. Simons Island is the largest of five barrier islands that form the Golden Isles. The island was originally cultivated by English colonists for rice and cotton plantations worked by African slaves but it was developed as a resort community in the early-20th century. 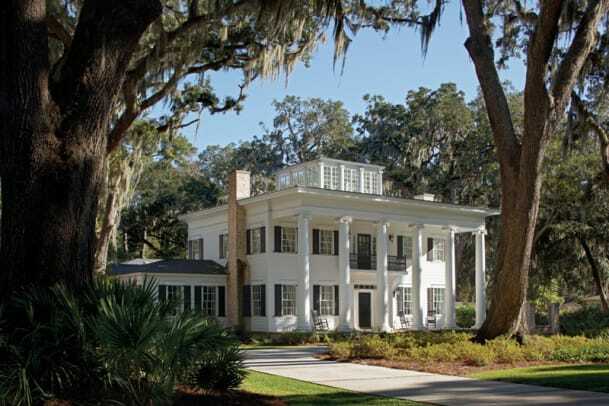 Home of the Marshes of Glynn, made famous by 19th-century poet Sidney Lanier, St. Simons contains large expanses of undeveloped land and winding roads of moss-draped live oaks – a perfect setting for any southern antebellum plantation home. Such was the vision of a couple, clients of Atlanta, GA-based Harrison Design Associates, when they purchased a parcel of land on the island. "The goal for this project was to create a well-designed home in the Greek Revival style," says principal and project manager Chad Goehring. "The clients wanted a family home suitable for modern living that had three bedrooms, a master suite on the entry level, a functional kitchen opened to the great room, a breakfast room and a formal dining room for when they entertained for various events." While the numerous live oaks on the property created an idyllic scene, they posed a challenge when siting the house. "When we walked through the lot with the clients it was obvious that several of the trees could be retained," says Goehring. "Two of them were in the foreground closer to the street, another is in front of the garage and adjacent to the master suite. Unfortunately, there was one right at the center of the lot that would have been a signature oak but we just couldn&apos;t work the design around that tree." The house was designed to appear as if it had expanded over time with a two-story main mass and single-story additions that extend to the three-car garage, built to look like an old barn through the use of reclaimed barn wood. The placement of the garage and the master suite, which is on the north side of the house, were in response to the oak that was located further in on the property; a curved driveway to the entry façade preserved the other two oaks at the front. In keeping with the Greek Revival style, the front elevation is defined by a two-story portico with six Ionic columns supporting a 4-ft.-tall entablature and dentil cornice, which runs throughout the main mass of the house. At the front entry, the door was left unadorned to give prominence to the Doric surround, square pilasters, transom and sidelights. Above the entry, a wrought-iron balcony that leads to the second-level stair hall is the same width as the door surround. A square belvedere atop the roof is styled with Ionic pilasters and contains four sides of windows with lake views beyond the treetops. On the side and rear elevations, the single-story elements contain simpler profiles to evoke a sense of hierarchy within the details. "The front portico and entablature are massive architectural elements," says Goehring. "As you go around the house, the scale of everything starts to break down back to human scale to become more manageable. The cornice becomes almost like a piece of crown and has a much smaller overhang. On the back porch, we went with scale-appropriate reduced entablature and columns, and on the garage, there is no eve at all with just exposed wood." In lieu of wood, the exterior was clad in cement plank siding. A painted PVC material, manufactured by Scranton, PA-based AZEK Building Products, was used to construct the entablature, cornice and molding details. Structural columns made from fiberglass were filled with 10 ft. of sand to keep them from sounding hollow. Asphalt shingles were laid on the roof while standing-seam metal was installed on the garage. At ground level, bricks with an antique finish were used to build a 2 ½-ft. high foundation to satisfy the island&apos;s FEMA codes. "In this location, we are challenged with issues of climate, moisture and longevity," says Goehring. "When faced with the possibility of selecting low-maintenance materials, we decided that this house couldn&apos;t be like other historical buildings that would have been all wood." Inside, the foyer features a three-story traditional staircase with stained handrails and treads as well as stair pickets and risers that are painted white. It is flooded with natural light from the belvedere above and leads to the formal living room and dining room on either side. The two formal rooms contain identical antique brick fireplaces, crown molding and cased openings, which are contemporary interpretations of the main entry&apos;s Doric surround. The living room also opens to the library/office, separated by a pair of columns. Toward the rear, the heart of the casual living areas is a great room that leads to a porch, which wraps around the corner to include a screened porch. 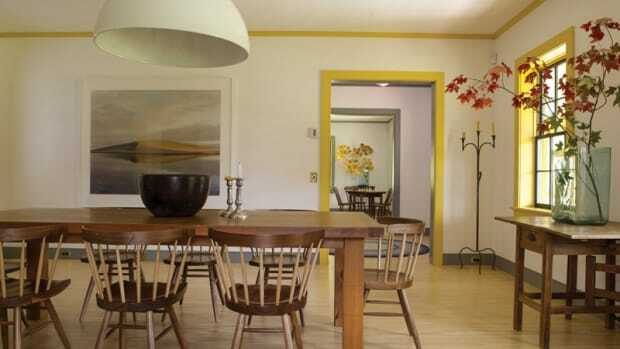 On the other end, the kitchen is opened to the great room and breakfast room creating a modern layout. Adjacent to the breakfast room, the service amenities include a walk-in pantry, mudroom, laundry room, access to the garage and secondary stairs to a bedroom suite above the garage, which can function as guest quarters. "We made the casual spaces open but we also created a way to close off the kitchen so that it could feel like a separate room," says Goehring. "We designed an island at the center of the opening between the kitchen and great room. 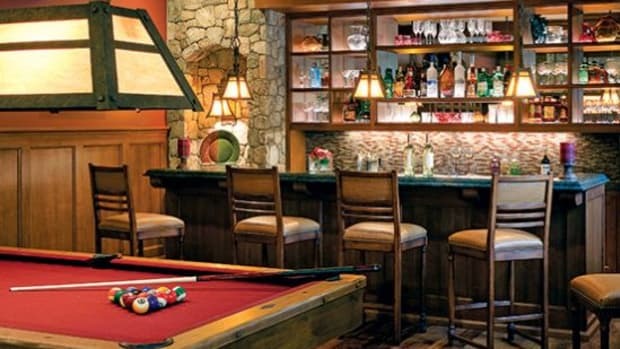 It has a cased opening and a raised bar top that can be closed off with shutters." The clients played an important role in sourcing antique and reclaimed materials. The oak floors throughout the interior were reclaimed from a tobacco factory. In the kitchen, the pendant lights above an oak butcher-block island were fashioned out of antique iron pulleys and the barstools were old tractor seats. Antique doors and hardware were installed in most of the bedrooms and bathrooms as well. "I think it is a pretty nice surprise," says Goehring, "when you walk through the house and experience all the new and all of a sudden there is something old and antique." To complement the kitchen&apos;s antique elements, the cabinets have a distressed finish, appliances were hidden or strategically placed out of sightlines and boxed out timber beams were stained to match the floors. An exposed brick wall serves as the focal point, and to bring more of the exterior within. On the second level, a sitting room and a media room accompany two bedrooms and a vintage-style bath containing mosaic floor tile, a cast-iron claw-foot tub, exposed plumbing fixtures and a suspended curtain rod. The one-room belvedere at the uppermost level houses a music and art studio, which would traditionally be at the terrace level. However, with moisture and flooding issues in the region, most coastal homes were not built with lower levels. Additional products and materials for this project include: Pella, IA-based Pella Windows & Doors; Stigler, OK-based Rosewood Fine Custom Cabinetry; Brunswick, GA-based Unique Building Supplies (butcher-block island top and hardwood floors); Macon, GA-based Cherokee Brick & Tile Co. (brick); City of Industry, CA-based Emtek (hardware); North Wilkesboro, NC-based Crown Heritage (columns & stairs); Towanda, PA-based MiraTEC Trim (siding); Mission Viejo, CA-based James Hardie (siding); Brunswick, GA-based Coastal Hardware (roofing materials); Miami Gardens, FL-based Century Metals & Supplies (roofing materials); and Wilmington, DE-based DuPont Tyvek (house wrap). "All in all, this project is a good interpretation of a Greek Revival with a little southern charm," says Goehring. "Tucked in and framed by majestic oaks, the house is beautifully placed. It feels like it may have been the original plantation home in the area and all these other properties popped up around it. There just isn&apos;t another house like this one on this portion of the island."